Braintree and Reading, MA (April 12, 2019) – Residents of Peter Sanborn Place, managed by full-service real estate and property management firm Peabody Properties, recently celebrated the tenure of Certified Older Adult Peer Specialist Mitch Halaby, who since August 2018 has led the Older Adult Peer Support pilot program. After accepting a new position, Halaby has been replaced by Joanne Wolf, also a Certified Older Adult Peer Specialist. Peter Sanborn Place’s Older Adult Peer Support pilot program is being coordinated in conjunction with the Executive Office of Elder Affairs, the Massachusetts Department of Mental Health, and Northeast Independent Living Program (NILP). During the ongoing weekly “Community Social Group,” folks interact in an open forum with a Certified Older Adult Peer Specialist. As a sendoff for Halaby, at the last weekly social he attended, residents arrived wearing t-shirts with his photo screen-printed on them. 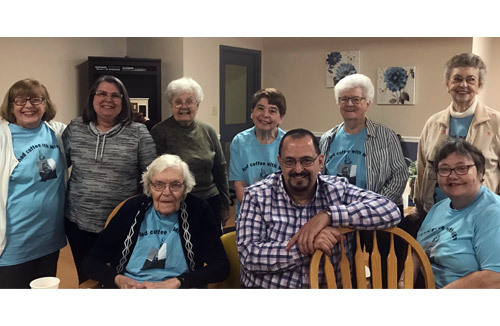 Halaby was moved by the gesture, and residents gained a deeper connection to the program. The weekly group continues to gain momentum, with up to 15 residents enjoying the company and conversation of both their neighbors and Wolf. The light atmosphere and inviting conversation topics have created a very comfortable setting for people to participate. Additionally, residents who would like to partake in individual peer support can be referred through their Aging Service Access Point, such as Mystic Valley Elder Services or Element Care PACE, and obtain the benefit of one-to-one peer support at home. Older Adult Peer Support is a relationship between people with similar lived experiences, and a mutually valuable exchange of hope, encouragement, connection, understanding, information, and/or assistance. Likenesses such as aging in place, overcoming physical illness or health challenges, mental health recovery, emotional distress, and trauma are just a small selection of topics covered during sessions. “We are so grateful for the Older Adult Peer Support program, and for all of Mitch’s contributions,” said Marcy Brown, Resident Service Coordinator at Peter Sanborn Place. “We’re thrilled that Joanne is carrying on this important effort, and we are excited that participation numbers continue to climb, which illustrates the value our residents place on this,” she added.